Home>Sports> Jayson Tatum: "I'd Trade Me Too For Anthony Davis"
Tatum and his father would understand if he was traded as part of an Anthony Davis deal. The Boston Celtics are one of the few teams in the league that have enough valuable assets to put together an enticing trade offer for Anthony Davis, should the New Orleans Pelicans look to move the All-NBA center. 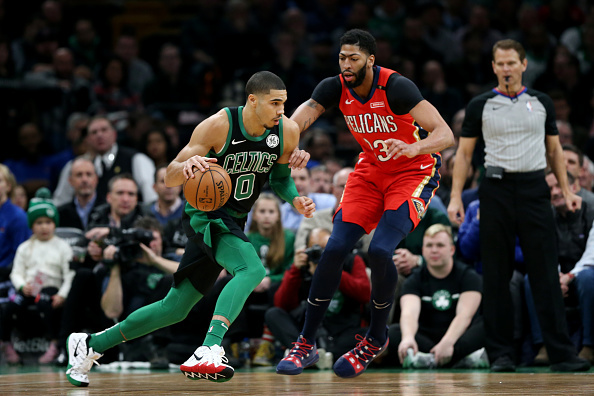 Any potential Celtics-Pelicans blockbuster trade would have to include rising star Jayson Tatum, who admits he'd understand if he was dealt in order to bring AD to Boston. Of a hypothetical Anthony Davis trade, Tatum's father, Justin, recently told Cedric Maxwell of The Sports Hub, "I would probably trade him [Jayson], too, if he wasn’t my son.’” When the 20-year old forward was told what his dad had said, he agreed with the sentiment. "Yeah, I'd trade me too for Anthony Davis," he told Maxwell. Davis, a five-time All-Star, is eligible to receive a $230 million supermax contract with the Pelicans this summer, but if he declines the team could look to trade him to the highest bidder. According to a December report by ESPN's Adrian Wojnarowski, the Celtics have been "hawking" Davis for years and have a plan to acquire the five-time All-Star should the situation arise. Davis is averaging 28.7 points, 13.3 rebounds, 4.4 assists, 2.6 blocks and 1.8 steals per game, though the Pelicans are currently sitting in 12th place out West with a 19-22 record. SPORTS Jayson Tatum: "I'd Trade Me Too For Anthony Davis"